There are lots of ways philosophy and comics might be related. There are comics about philosophy and philosophers (Action Philosophers, Logicomix); other comics might be said to address philosophical issues without really being about philosophy or philosophers (Dinosaur Comics is sometimes like this); there is philosophy through comics — philosophical works that use comics to popularize philosophical ideas (see the Blackwell Philosophy and Pop Culture series); there are philosophically minded comics authors (Moore, Morrison and Ditko come to mind); and of course there are philosophers such as myself who like comics. (Philosophers in my department are well-known in the Leeds comics shops!) The philosophy of comics is something entirely different from all of these – it consists in the investigation of the philosophical questions raised by comics themselves. The philosophy of comics is, then, a relatively new branch of the philosophy of art. Like the philosophy of film and the philosophy of music, the philosophy of comics investigates the distinctive philosophical puzzles and problems raised by a particular art form or medium. Let me emphasize that these are philosophical problems and puzzles. The philosophy of comics is not, at least not centrally, a matter of interpreting or evaluating or promoting particular comics or particular genres (i.e., it is not comics criticism). And it is not the history or psychology or linguistics of comics either, although all those areas of enquiry might be important for the philosophy of comics. So what are those distinctive philosophical puzzles and problems it investigates? McCloud’s answer to the ‘What is a comic?’ question, ‘Juxtaposed pictorial and other images in deliberate sequence, intended to convey information and/or to produce an aesthetic response in the viewer’ (McCloud 1993: 9) has not convinced many philosophers. The definition is too broad because it counts as comics such things as painted triptychs and narrative tapestries, it is too narrow because a comic might be made with different sorts of intentions. But that’s philosophy for you. My guess is that McCloud offers such a wide definition of comics because he wants to legitimate the art form—if comics have been around for centuries they must be taken seriously. But I think this is a mistake. Comics should be taken seriously in their own right because of their artistic capacities (they can do pretty much everything literature and painting can do, and more besides), not because they’ve been around for a long time. The way people think and talk and evaluate comics suggests that works of art like the Bayeux Tapestry just don’t belong to the same art form as Maus and David Boring. In any case, McCloud’s definition has inspired a number of philosophers to think about the topic. For a sampling of philosophical work on this topic you might take a look at my essay, ‘Defining Comics?’ (Meskin 2007), in which I argue that all extant definitions fail and there is no need to define comics in the first place. We can, I suggest, identify and evaluate and interpret them without having a definition. Or take a look at Roy Cook’s recent paper in the same journal, ‘Do Comics Require Pictures? Or, Why Batman #663 is a Comic’ (Cook 2011), in which he argues that nothing can be a comic unless it is a part of some comic that does contain pictures. Note that such a view allows for the possibility of comics without pictures if they are part of a sequence (e.g., a run of issues) that does contain pictures and counts as a comic in its own right. Or check out John Holbo’s recent paper in a book I recently edited with Cook, The Art of Comics: A Philosophical Approach (Wiley-Blackwell 2012), which offers a surprising defence of the significance of McCloud’s definition. McCloud, Holbo argues, ‘has, in effect, written an eloquent, insightful treatise on “the graphical work”’ (Holbo 2012). It’s not all about definition though. What other questions about comics have philosophers explored? Here is a brief list: Is there a distinctive relationship between words and images in comics? Does it make sense to talk about a language of comics? How does narrative work in comics? What is the nature of humour and funniness in comics? How do we properly interpret comics? What are the relationships between comics and other art forms such as film and literature? Are comics a post-historical art? What is a comics genre? And that’s just a sample of the recent work on the topic. It is recent work. As I mentioned above, the philosophy of comics is fairly new. David Carrier’s 2000 book, The Aesthetics of Comics, was the first serious work on the topic by a philosopher writing in English. This might seem surprising. Comics have been around since at least the middle of the nineteenth century. Film is a younger art form, but philosophy of film has been around for decades. Why hasn’t there been a philosophy of comics until pretty recently? There are lots of potential explanations including the hybrid nature of the art form as well as its generally low cultural status in the West—I explore some of these in a recent article in Philosophy Compass (Meskin 2011)—but the good news is that the philosophy of comics is up and running now. In future posts I hope to say a bit more about what philosophers of comics have done and where they might be heading next. Cook, R.T. (2011) ‘Comics without Pictures, or, Why Batman #663 is a Comic,’ Journal of Aesthetics and Art Criticism 69: 285-296. Holbo, J. (2012) ‘Redefining Comics,’ in A. Meskin and R.T. Cook (eds) The Art of Comics: A Philosophical Approach. Malden, MA: Wiley-Blackwell. McCloud, S. (1993) Understanding Comics: The Invisible Art, New York: Harper Collins. Meskin, A. (2007) ‘Defining Comics?’ Journal of Aesthetics and Art Criticism 65: 369-79. Meskin, A. 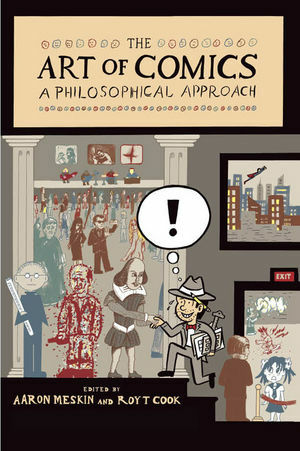 (2011) ‘The Philosophy of Comics,’ Philosophy Compass 6: 854-864. Aaron Meskin is a Senior Lecturer at the University of Leeds. He works on the philosophy of art, with an emphasis on popular art forms including film, videogames, photography, and (most important for our purposes!) comics. He was the first aesthetics editor for the online philosophy journal Philosophy Compass, and recently co-edited of The Art of Comics: A Philosophical Approach (Wiley-Blackwell, 2012). His writings on comics have appeared in a number of academic journals, including Philosophy Compass, the British Journal of Aesthetics, and The Journal of Aesthetics and Art Criticism, as well as in anthologies including The Routledge Companion to Aesthetics 3rd ed. (Routledge, forthcoming), Watchmen and Philosophy: A Rorschach Test (Wiley-Blackwell, 2008), and the aforementioned The Art Of Comics: A Philosophical Approach. For more about his new co-edited book see this interview (with Roy T Cook) promoting The Art of Comics: A Philosophical Approach at The Philosopher’s Eye.